WASHINGTON - World-renowned animated icon Wile E. Coyote will finally catch up with the Road Runner, if only for a brief moment, when the first-ever commemorative postage stamp to be issued in cyberspace by the U.S. Postal Service debuts on April 26, 2000. The event marks not only the first time a U.S. stamp has been dedicated on-line, but also the first time consumers can purchase stamps via the Internet on the first day of issue. Traditionally, first day of issuance ceremonies are held in a single city and the stamps made available exclusively in that location for one day. The Wile E. Coyote and Road Runner stamp will be officially dedicated by Time Warner Chairman and CEO Gerald Levin, Warner Bros. Chairman and CEO Barry Meyer and James Tolbert, Postal Service Executive Director, Stamp Services, during a history-making live Webcast at 4 p.m. ET. The Webcast will take place on America Online (keyword: BeepBeep), Warner Bros. Online (www.warnerbros.com) and on the Postal Service's Web site at www.stampsonline.com. The Time Warner Media Center at the Children's Museum of Manhattan will serve as the host site for the on-line event, where local schoolchildren will participate in the ceremony by unveiling the stamp on the Internet. "The Wile E. Coyote and Road Runner stamp is a colorful and exciting addition to our nation's commemorative stamp program," said Tolbert. "Their ongoing feud is based largely on speed and ingenuity, which is a fun-loving reminder of the Postal Service's continued success in improving the speed and efficiency of mail service to everyone, everywhere, every day." "A long time ago, Road Runner and Wile E. Coyote taught us the two essentiallessons of the broadband revolution: Speed is everything, and no matter how many obstacles you may face along the way, never stop trying," said Levin. "Today, we honor these two digital pioneers with a commemorative stamp. We at Time Warner are proud of the honor paid to two of our favorite colleagues, and we are determined to keep following their example of speed and persistence as we set the pace of innovation on the digital highway." "Warner Bros.' beloved animation director Chuck Jones invented Wile E. Coyote and the Road Runner as two tireless adversaries on a never-ending chase," said Meyer. "It's a great honor to have these classic animated characters immortalized on a U.S. stamp." The desert home of Wile E. Coyote and Road Runner will be the site of the stamp's "terra firma" first day of issue site with a ceremony at 10 a.m. MST at the Pecos Station Post Office in Phoenix, Ariz. The ceremony will be free and open to the public. 300 million self-adhesive Wile E. Coyote and Road Runner stamps have been printed. 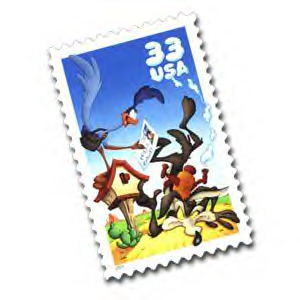 The stamp features the letter-delivering Road Runner perched atop a mailbox and the ever scheming Wile E. Coyote, whose plot to make a meal out of this special mail carrier is foiled. The Wile E. Coyote and Road Runner stamp is the fourth in a series of U.S. stamps honoring Warner Bros.' famed Looney Tunes characters. The Bugs Bunny stamp launched the series in 1997, followed by stamps honoring Sylvester and Tweety (1998) and Daffy Duck (1999). "We're proud to have joined with the Postal Service. first with Bugs Bunny, then with Sylvester & Tweety and Daffy Duck, and now with Wile E. Coyote and the Road Runner. to help young people across the country discover the joy of stamp collecting," said Dan Romanelli, President, Warner Bros. Worldwide Consumer Products.